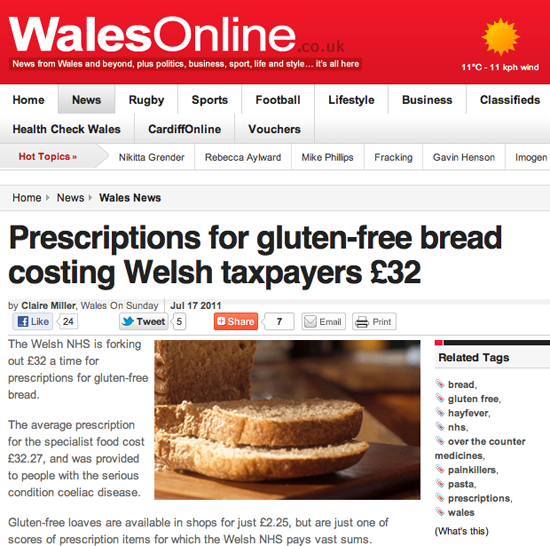 A story for Wales on Sunday about how much the Welsh Government is spending on prescriptions for gluten-free products, contained the headline figure that it was paying £32 for a loaf of bread. However, this was actually 11 loaves that cost £2.82 each. The figures, from a Welsh Assembly written answer and a Welsh NHS statistics release, listed the figure as cost per prescription item. However, they gave no additional definition in the data dictionary of what a prescription item might refer or how a separate quantity column might define it. The assumption was that it referred to an individual item, e.g. a loaf of bread, rather than what it actually was, a pack of several loafs. No one, not the people who answered the written answer or the press office, when it was put to them, raised the issue about quantity until the Monday after the story was published. So do not assume that the background notes for Government data will help explain what information is being presented or that the people responsible for the data will realize the data is not clear even when you tell them your mistaken assumption. Generally newspapers want things that make good headlines, so unless something obviously contradicts an interpretation, it is usually easier to go with what makes a good headline and not check too closely and risk the story collapsing, especially on deadline. But journalists have a responsibility to check the ridiculous claims even if it means that this drops the story down the news list.